This weekend, in a blockbuster move, the Oklahoma City Thunder traded guard James Harden—an All Star, Olympian, and last season’s Sixth Man of the Year—to the Houston Rockets. 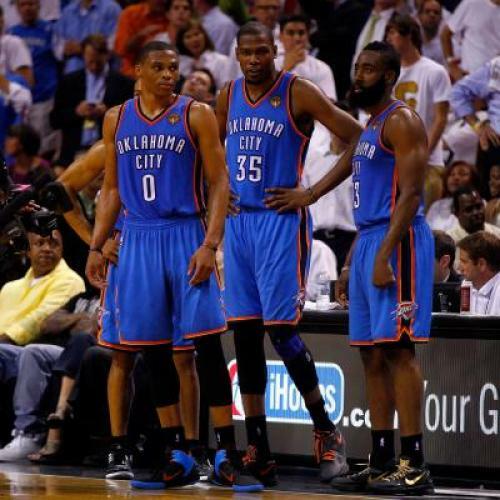 Because Harden’s talents would best be exploited on a team that does not also have Kevin Durant and Russell Westbrook, two of the best scorers in the league, and because the trade sends Oklahoma City two promising youngsters and two additional first-round draft picks, the consensus seems to be that the Thunder, which lost to the juggernaut Miami Heat in last year’s Finals, wisely sacrificed a decent shot at winning it all next year for an even better shot at winning it all a few years from now. But the main surprise is, well, everyone’s surprise. This was the rational decision. Oklahoma City could have kept Harden by offering him $60 million over four years, which is what he gets from Houston, and taken a luxury tax hit. But a newly punitive luxury tax instituted last year when the players and owners signed a new collective bargaining agreement made this as logical a move for them as it was for the Rockets. Like the rest of the league’s salary cap infrastructure, the tax is designed to distort the market in a way that distributes stars more evenly while preserving players’ rights to get more money for better performance. In several months, when the Thunder and the Rockets meet in the playoffs—a scenario that this weekend’s move made far more likely—it will be apparent that policies encouraging competitive balance reward the fans most of all. There has undeniably been something special about the Thunder these past few years. Durant, Westbrook, and Harden—the oldest, Durant, just turned 24—rose from raw and exciting, the basketball equivalent of indie darlings, to a team three wins away from a championship. Any implicit rivalries among them were alchemized into further productivity on the court and marketability off it. Durant’s fluid, almost retro moves, veteran Nick Collison’s wisecracks, and most of all Harden’s distinctive facial hair even gave the Thunder something resembling hipster cred. It is a bit of a bummer that they won’t be playing together anymore. But there is nothing wrong with Harden letting money do the talking. Indeed, Harden’s decision to leave for more money deserves more than a grudging, “Well, of course he’s entitled….” It is downright honorable for an NBA player to demand the maximum amount the market will pay. By increasing his own stardom (since he will now be an alpha dog) and providing juice to the previously moribund Rockets franchise, Harden’s move will likely increase league revenue, in turn raising the salary cap, in turn driving up the pay of his National Basketball Player’s Association comrades. It also sends a powerful signal to owners about the importance their employees place on compensation. Meanwhile, put yourself in a Houston fan’s shoes. A few years ago, you were burned by Yao Ming’s chronic injuries and Tracy McGrady’s chronic Tracy McGrady-ness (he is a super-talented headcase who never really made it all come together). Last year, outgoing NBA commissioner David Stern egregiously vetoed a trade that would have sent you the Los Angeles Lakers’ Pau Gasol, one of the game’s elite big men. Then, you missed out on the guy you had cut the promising Luis Scola for and generally spent years clearing cap space for when the Orlando Magic’s Dwight Howard, the league’s best center, signed with … the Lakers. (Remember, you already hate the Lakers, because they are the Lakers.) Finally, you have Harden, a dynamic 23-year-old star who, with the right tools around him, can really take you places: not to a championship, but on some pretty fun rides. And now pan back a bit. Thanks to things like season-long weekly ESPN and TNT broadcasts, Twitter, and League Pass, the NBA is increasingly oriented around national fans enjoying basketball as a consumer experience rather than local fans impassioned by their home teams. This means that it is more crucial than ever for there to be as many exciting squads as possible. The more punitive luxury tax and the salary cap generally discourage the clogging of superstars in only a few locations precisely to spread the talent and nationalize the league’s popularity. Here, it worked: with Houston, the club of fun teams just admitted one new member. The Rockets’ starting backcourt will be Harden and Jeremy Lin. That is must-see TV.